How did Rifqa Bary end up being exploited on a national conference call with Religious Right leaders Shirley Dobson, Tony Perkins, and New Apostolic prophet Lou Engle? This was supposedly a mission to rescue a young girl from an imminent death, but somewhere along the way Rifqa became the poster child for Christian supremacism and a holy war in preparation for the end times. What happened, and has this case helped or hurt the cause of fighting honor killings? This past week I wrote an article for Zeek about the phenomenon of Jewish leaders promoting Islamophobia and embracing Christian supremacists, a decision that I view as short-sighted and self-destructive. Curiously that article caused quite a backlash against me in the right wing blogosphere. My article focused on the role of Jewish feminist Phyllis Chesler in context of the controversy surrounding Rifqa Bary over the past year, a young woman whose family is from Sri Lanka, but has resided for several years in Ohio. Rifqa converted to Christianity around age twelve, and at seventeen, with the help of charismatic evangelicals, ran away to Florida. She subsequently claimed that if she was returned, her family would kill her. It was, and continues to be, an difficult situation with Rifqa maintaining that her life is in danger, and her family claiming that she has been taken in by a cult like belief system that has turned her against them. Rifqa is now living in foster care in Ohio, awaiting her 18th birthday. I would not have wanted to be in the shoes of either the Florida or Ohio judges in this case, and defending Rifqa's parents was not the purpose of my ZEEK article. My purpose was to examine the empowerment of dominionist-based Christian movements as a way to counter Islamic extremism, particularly when it is Jewish leaders who are providing legitimacy to Christian supremacists. Several of the groups that Rifqa Bary became associated with both before and after she ran away are part of the growing ideology of the New Apostolic Reformation, a very specific sector of charismatic evangelical belief which teaches that Christians must take "dominion" over the earth. Both Richard Bartholomew (Bartholomew's Notes on Religion) and Kyle Mantyla (Right Wing Watch), monitored the unfolding drama regularly last summer and fall. "America is receiving Her apostles, prophets, and evangelists, but She has not yet seen Her Nazirites!" In her transcript with the Florida authorities, Rifqa describes Engle as "like her hero." One of the defining manifestations of the "Holy Spirit outpourings" at these youth oriented events is supernatural healing. An example can be seen at the current posting of an outbreak at the Kansas City IHOP. On the video, one of the first young people interviewed says that his eyes were healed, and all types of supernatural healing of physical and mental illness supposedly take place at these events. It is indicated by the pastors who supported Rifqa, Jamal Jivanjee in Ohio, and Blake Lorenz in Florida, that she believed that she could be supernaturally healed through her new faith. Rifqa has a serious and very visible eye injury from her childhood, and keeps her hair swept down over that eye. Lorenz even publicly prayed that Rifqa's eye would be healed as a sign to the world. "These are the last days, these are the end times, and this conflict between Islam and Christianity is going to grow greater. This conflict between good and evil is going to grow greater." Blake and Beverly Lorenz, with whom Rifqa stayed for several weeks in Orlando, have since been relieved of their positions with the Global Revolution Church. The leaders who incorporated the church accused the couple of lying about their actions and also for opening a fund in the church's name after promising to keep the issue separate from the church's affairs. Blake Lorenz responded by calling these church leaders "demonically possessed." "Have the whole world prayer for this which is going on today and in California because what happens in California will release a spirit that is more demonic than Islam." At the end of this video you can hear Engle calling for martyrs. The demonic principalities which New Apostolics claim block evangelization of communities are described in terms of "generational curses" and "territorial demons." The expulsion of these demons is believed to be required in order to free ethnic and religious groups to be evangelized. Engle describes his mission as training up a young generation of Christian warriors who will be supernaturally empowered to defeat evil on the earth, in other words to put an end to all other religions, belief systems, and denominations, Christian and otherwise, who do not share their brand of faith. After running away, but before being returned to Ohio, Rifqa was the star feature in a national phone call with Religious Right leaders Lou Engle, Shirley Dobson, and Tony Perkins. In the phone call Rifqa can be heard praying frantically for "generational curses" to be removed from her people and for God to spit fire from heaven to break the hardened hearts of her people. "On Monday, Rifqa Bary, a young 17-year-old woman, will be in the headlines of U.S. news." She [Rifqa] has already said that this is not about her, but about many Muslims coming to Jesus. We must pray for her lawyers who are being bullied, threatened, and challenged on every side." Insuring this young girl's safety was a priority, but somehow along the way, Rifqa became a Christian conquest, a poster child for the glories of Christian dominionism and the evils of Islam. This certainly did not aid the cause of fighting honor killings. Conversely I believe that it only hurt the cause, as well as Rifqa's credibility. In Part One, I wrote about Phyllis Chesler, a Jewish feminist, writer, and professor, who was featured as the expert on Rifqa's situation in numerous news reports. Chesler does not appear to see the dangers in fanning the flames of Islamophobia and Christian supremacism in her single-minded pursuit. Honor killings are horrific and should be a cause of anyone concerned with human rights (not just feminists), but Chesler and a team of Islamophobia warriors were determined that the press would see only their version of this saga. "Anyone who converts from Islam is considered an apostate, and apostasy is a capital crime. If she is returned to her family, if she is lucky, they will isolate her, beat her, threaten her, and if she is not `persuaded' to return to Islam, they will kill her. They have no choice." In her response to my Zeek article Chesler claimed that she "had absolutely nothing to do with the activism around the Rifqa Bary case." However, she made statements like the one above in numerous television and print interviews, and on her own blog stated last August that she had written a letter to the judge in Florida. Hats off to all the warriors who fought in this battle. First, to Rifqa's lawyer, Rosa Gonzalez - and Blake and Beverly Lorenz, the pastors who initially sheltered her; to the on-the-ground team of activists and bloggers (Andy Bostom, Brigitte Gabriel, Pamela Geller, Jeffrey Imm, Robert Spencer, Dr. Rusty Shackleford, and Tom Trento) who got the word out; to all the blog readers who sent letters to the Florida Governor; to the experts, such as Nonie Darwish and Wafa Sultan who issued statements; and to those whose Rifqa's lawyer asked to send letters to the judge (that would be my friend and colleague, Ibn Warraq, and myself). In the linked video, Chesler was interviewed by ABC News, which for some reason incorrectly described her as Rifqa's lawyer. This group of warriors above (covered more thoroughly in Part One), put out a nonstop narrative on Rifqa's case, and also on their absolute knowledge that Rifqa's family were lying, that all Islam is evil, and attacking the "Dhimmi media" anytime they questioned the circumstances around Rifqa's claims. Donations were solicited for a fund which was managed by "Michael A. O'Quinn," an attorney and major Republican figure in Florida. 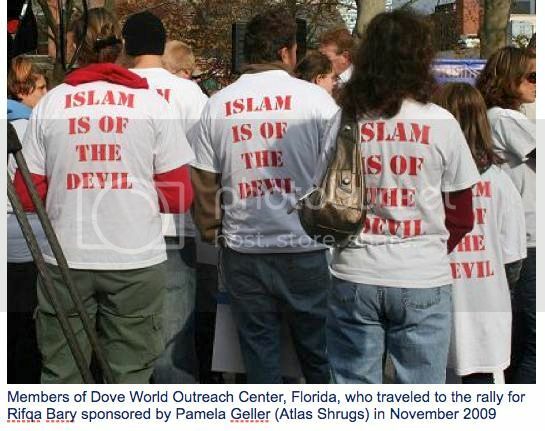 As the case was going to court in Coumbus, Ohio, a "Free Rifqa Rally" was held across from the courthouse for activists including a group from Florida Dove World Church with t-shirts reading "Islam is of the devil. Speakers included sponsors Pamela Geller, Robert Spencer, and also Jamal Jivanjee. "The Lord has used her to physically and spiritually heal people, and bring people into a relationship with God everywhere she has went. She has done this in places like high school, summer jobs, and more recently...jail cells." Jivanjee is also, coincidentally, the person who supplied evidence to other evangelicals that Ergun Caner, head of the Liberty University's Baptist Seminary converted from an extremist form of Islam as he claims. (In some sectors of the evangelical world, the more extreme one's background was before one's conversion, the better the salvation story. Muslim and Jewish converts are particularly valued.) Caner's rapid ascent in the evangelical world since 9/11, was aided by his claims of knowledge about Islamic extremism. Recently Caner's conflicting stories began to challenged by evangelical bloggers and this past week Liberty University announced an investigation into Caner's claims. As Richard Bartholomew points out, Caner was also one of the experts who claimed that Rifqa's life was definitely in danger. As Right Ring Watch indicated, the Florida Department of Law Enforcement found nothing to substantiate the claims that Rifqa was in danger or had been abused. The report did reveal that Rifqa had been dishonest about a number of issues including how she arrived in Florida and her claim that a teacher had offered sanctuary in her home due to the threats from her family. When the teacher was interviewed she reported that she had no knowledge of any threats to Rifqa because of her faith, but had offered her a place to stay when Rifqa's older brother had parties with alcohol when the Bary parents were out of town. Michael Kruse of the St. Petersburg Times took a great deal of abuse in the right wing blogosphere for pointing out that Rifqa Bary's situation may not have been as initially portrayed. "The story of her life in between is the journey of a teenage girl, the only daughter in an immigrant family, a brown-skinned, lower-middle-class high school student in a mostly well-to-do, white suburb, looking for a place to belong. What started as adolescent identity issues and predictable tensions with her parents ultimately became a plan to escape. In her mind, it was her role in an epic battle between God and the Devil, in which she was both a prize and a prophet." Imagine for a moment if the Barys are not guilty, and their daughter ended up "halfway across the country" in the arms of a stranger they did not know, who believes that the imminent end times is going to preceded by a battle between Christianity and Islam. The fact that Rifqa ended up as a poster child for Christian dominionism did not seem to concern Chesler, Geller, Spencer and the others fighting their own battles. This past week I found articles about myself in unexpected places - the American Spectator, David Horowitz RealNews Blog, R.S. McCain's blog, and somebody named Kathy Shaidle whose current article claims that "more abortion doctors were killed on the television series Law and Order than in real life." R.S. McCain is a regular cheerleader for the Geller and Spencer crowd, and has equally enlightened views on dealing with the Israeli and Palestinian conflict. The following is from a post in McCain's blog in which he begins by calling Glenn Greenwald a self-hating Jew and then describes his answer to the Israeli and Palestinian conflict. Swear to God, if they ever want a Gentile prime minister, my first order would be to deploy the IDF in a north-south line, facing east. My second order would be "forward march" and the order to halt would not be given until it was time for the troops to rinse their bayonets in the Jordan. After a brief rest halt, the order "about face" would be given, and the next halt would be at the Mediterranean coast. That's my "Middle East peace plan," and until it's carried out, there will be no peace. I purposely stayed far away from Bary's supporters--not because they were Christians or conservatives but on the off chance that my academic studies about honor killings might become part of the legal record in this case. Perhaps that is the point: To rile your audience up against right wing Christians so they will forget all about Islamist hatred of infidels, opposing Islamic sects, women, and the general practices of Islamic gender and religious apartheid. According to Chesler apparently one can not possibly be concerned about the American Religious Right while Islamic terrorism looms. This reminds me of a time, not so many years ago, when Americans were told that we must stay focused on the "evil empire" of the Soviet Union and not worry about arming a few mujihadeen in Afghanistan to fight the infidel. Promoting religious extremism is shortsighted, as history has proven over and over. Just because Phyllis Chesler apparently knows nothing about the fires of Christian extremism that she is fanning does not mean that they don't exists. My focus on the American Religious Right does not make me an apologist for Islamic extremism, either here or abroad. If the world is viewed as a zero sum game between competing religious supremacists, there is no hope for peace or coexistence. Secular democracy and religious pluralism will be the casualty. Robert Stacy McCain is a fixture of the neo-Confederate movement. It doesn't surprise me to see him mixed up in this at all, nor does it surprise me to see Pam Geller mixed up in this. What is shocking is that there are many people who are party to these activities who still want to be viewed as progressives and defenders of secular democracy and religious pluralism. I think the reason there was such backlash about my Zeek article is that Phyllis Chesler would rather that liberal Jewish readers not look too closely at her recent activities. I've been surprised at how many people had no idea about her defection to the Right. Phyllis Chesler had published a book several years ago detailing her concerns over Islamism, but she doesn't see a clear threat closer to home. As for Pam Geller, the less said about her the better. These are also Sarah Palin's religious beliefs. She is not only dangerous because of her lack of knowledge but because she is hellbent on making this country a theocracy. As a former catholic, I always wondered why the catholic church teamed up with the evangelicals.Obviously the abortion issue. But, why would you team up with another religion that does not see you as equals, but as fake christians? It also amazes me that Jews support these fanatical christians, when all they want is the Jews to retake the Holy land so they can all be killed with all the other fake christians and the evil ones. I've been following the Rifqa Bary story, trying to develop some commentary about it for my own blog. You've done a much better job than I could have. I suspect, given my limited contact with the kind of Christians involved, that Rifqa was misled into believing her parents would kill her. It seems her knowledge of Islam was not especially strong, and as an impressionable teenager, she was ripe for the picking, as it were. Meanwhile, these so-called Rifqa supporters, chiefly Geller and her poisonous Atlas Shrugged website, have libeled the Bary family repeatedly, merely because they are Muslims. These hypocrites would be singing a different song if Rifqa had been lured away and housed by some wacko cult (or child abuser) AND had Christian or Jewish parents. Instead, the people who manipulated her get a free pass because they are "Christians" and Rifqa is supposedly a convert. There was some rumor flying about in the Geller echo chamber that Brian Williams might be arrested. Does anyone have any reliable reports supporting or refuting that idea?